Batman v Superman: Dawn of Justice is one of 2016's most anticipated movies. The Zack Snyder flick pitting the Dark Knight (played by Ben Affleck) against the Man of Steel (Henry Cavill) will likely be a box office blockbuster of epic proportions. DC Comics and Marvel Studios are at the helm of this resurgence in superhero movies. DC's Batman came in the form of the Christopher Nolan/Christian Bale trilogy and its newest Superman reincarnation in the Zack Snyder/Henry Cavill partnership. Batman v Superman: Dawn of Justice features both (with a different Batman); and though there is much to derive from the Caped Crusader's anthology, Superman's storyline is the superhero tale rich with faith connections and parallels. To fully understand the impact and faith correlations, you've got to back in time...back to 1978. Superman pauses in mid-flight. He gazes down at Earth, our home. A smile flashes across his face. We are safe. He's watching over us. That's the last image we see in Superman: The Movie, starring Christopher Reeve. For Stephen Skelton, that image stuck with him when he first saw the movie as a kid. From that day on, Superman became a heroic inspiration. As an adult, he became a source of spiritual connections. 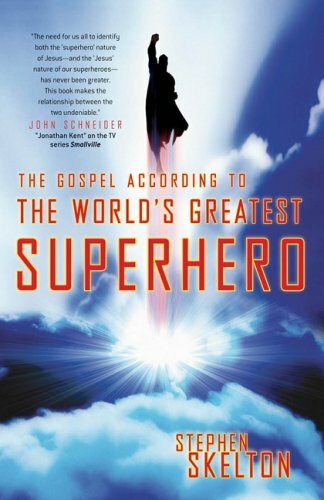 Skelton even wrote a book, The Gospel According to the World’s Greatest Superhero, to share what he found in his research -- that the stories of Superman and Jesus are connected. “Superman’s story goes something like this… From above, a heavenly father sends his only son to save the Earth. When he comes down to Earth, he’ll be raised by two parents who originally had the names Mary and Joseph – now this is the Superman story we are talking about,” Skelton says. When Superman comes of age, he travels to the arctic wilderness to commune with his father’s spirit, which mirrors Christ’s journey into the desert. He comes back to life after being killed in the last comic book published in 1992 called The Death of Superman. Then, Superman comes back to Earth – this is where the storyline in 2006's Superman Returns picks up. “Within the specifics of that story, I know of no other story that mirrors it so closely than the Christ story,” Skelton says. The original 1930s Superman comic strip, created by Jerry Siegel and Joel Shuster in the 1930s, wasn’t supposed to reflect the Gospel story. The two Jewish teenagers simply stumbled onto the symbolic plot when they were creating an adventurous tale about an out-of-this-world superhero. Siegel and Shuster drew from biblical heroes, such as Samson, who was the strongest man in the Bible, and Moses, who helped free God's people from slavery. The familiar storyline just happened to be one they used because it sounded like the most logical way to layout the story of a great hero. Superman's origin came out of the loss of Jerry’s father, who was fatally shot by a robber, at a time when America was battling with the Great Depression and the world was just about to begin its fight with Hitler. “They were looking for a savior figure they could relate to, they could envision, something to give them hope, inspire them,” Skelton says. X-Men director Bryan Singer brought Superman back to the big screen with his movie, Superman Returns. Although the correlation to Jesus’ story could have easily been left out, filmmakers have kept its strong ties to the Bible. Singer, who is not a Christian, also determined not to overlook it in Superman Returns. Besides the parallels between the two plots, strong symbolism abounds in the adventures of Superman that point directly to God. Skelton’s book specifically discusses the meaning found within Superman’s costume. One particular symbol that is interesting to Skelton is the triangular shield, which holds Superman’s S-shaped family crest. Historically, a triangle is the symbol for the Trinity, the Father, Son, and the Holy Spirit. The triangle used on Superman’s costume points down signifying God’s relationship with man and the gift of His only Son to mankind. Other superheroes have come onto the scene through the years; Batman, Spiderman, Thor, Iron Man, and Wonder Woman are just a few. So, why has Superman maintained worldwide prominence for more than 75 years while others have not? According to Skelton, people are intrigued by Superman simply because of his close resemblance to Christ. After watching Superman Returns back in 2006, Skelton talked with a non-Christian friend about the movie. What Skelton gleaned from that conversation was the incredible power of film. Stay tuned for CBN.com's review of Batman v Superman: Dawn of Justice, starring Ben Affleck and Henry Cavill. The Warner Bros. picture is rated PG-13 and releases in theaters nationwide on Friday, March 25, 2016.